Detail of Retreat to Victory by Henry Hintermeister, 1961. Gift of Charles Lauriston Livingston, Jr. Collection of Fraunces Tavern® Museum. 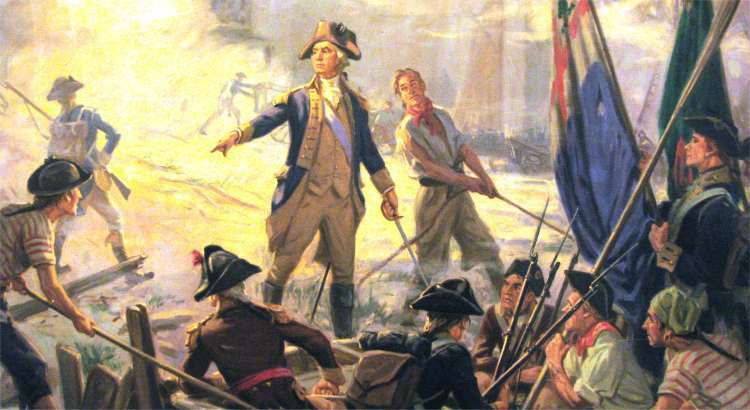 The Battle of Long Island (27 Aug. 1776) was one of the most significant engagements of the American Revolution and the first fought after the Declaration of Independence. Fraunces Tavern® Museum commemorates the events of August 1776 with two special lectures in the Flag Gallery. On Tuesday, Aug. 19, at 12:30 p.m., National Park Service Ranger Michael Callahan will speak on The King's Men: The British Army Fights the Battle of Brooklyn. To round out the week, FTM welcomes William J. Parry for a fascinating talk on The Strange Case of 'Baron' Herman Zedwitz: Genius, Traitor of Madman? Parry's talk takes place on Thursday, Aug. 21 at 6:30 p.m. Click here for more information. Many other special Balttle Week events are planned throughout New York City for Battle Week. The Old Stone House in Brooklyn will host a series of special events from Aug. 14-16; for information, call 718-768-3195. On Sunday, Aug. 24, Green-Wood Cemetery will mount its annual commemoration of the battle and the men who fought it. Detail of Washington and Staff Watching the Battle of Long Island, circa 1920. Gift of the George A. Zabriskie Memorial, 1936. Collection of Fraunces Tavern® Museum. As our readers know, the Dunsmore collection of paintings is being conserved through the generosity of corporate and private donors. 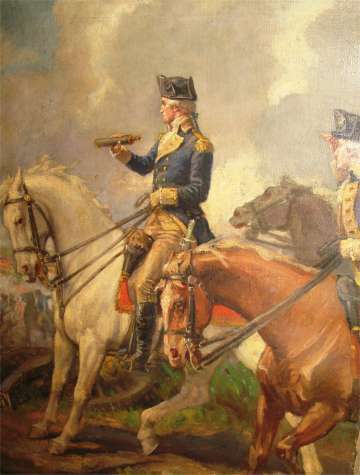 We'd like to highlight a special painting this month: Washington and Staff Watching the Battle of Long Island. (See photo.) This small painting can be conserved for $2,000. It was a gift of the George A. Zabriskie Memorial in 1936; the painting itself was completed circa 1920 and measures 16" x 12" - a gem awaiting some much-needed work. If you'd like to contribute a sum small or large - or perhaps fund the entire project - please call Museum Director Amy Northrop Adamo at 212-425-1778 or email 2director@frauncestavernmuseum.org. Which of the following does not commemorate the Battle of Long Island? Amy Adamo reports that award-winning filmmaker Ric Burns and his company, Steeplechase Films, recently filmed interviews for several new projects in the Long Room and the Loeb and Davis Galleries. They'll be back in August to continue their interviews, which will appear in future Steeplechase works. We'll keep you posted! Night walkers pause to listen to tour guide James Kaplan's commentary early in the morning of July 4th. Once again, the all-night July 4th walking tour of Lower Manhattan, led by James Kaplan, was a great success. More than 130 participants wended their way through the hushed, dark streets in an imaginative journey back to Revolutionary War-era Manhattan. (See photos.) Be sure to join us next year for this very unusual event! Join us on Tues., Aug. 5, at the new Sports Museum of America, 26 Broadway, where Board of Managers member Charles A. Poekel, Jr., will sign copies of his popular book, Babe & The Kid: The Legendary Story of Babe Ruth and Johnny Sylvester . Drop in between 12:30-2 p.m.; you'll find Charles in the gift shop, to which admission is free. See you there! Additional special events are planned for Nov. 24. Stay tuned for details. Please note: This summer, 54 Pearl St. may undergo some vital renovations. Be sure to confirm all events listed below or call 212-425-1778 in advance of the event. August 19: Michael Callahan. The King's Men: The British Army Fights the Battle of Brooklyn. Flag Gallery,12:30-1:30 p.m. Free with Museum admission ($4/$3 students, senior citizens); members free. August 21: William J. Parry. The Strange Case of 'Baron' Herman Zedwitz: Genius, Traitor of Madman? Flag Gallery,6:30 p.m. Fee: $6 (FTM Members free) includes museum admission and refreshments. Save the Date: Thurs., Feb. 19, 2009: SRNY George Washington's Birthday Ball at the Metropolitan Club. Invitations will be mailed later this year. A crowd of more than 130 enjoyed the all-night walking tour on July 4.